Run Forrest run! Inspired by the famous movie in 1994, Forrest Gump, Bubba Gump Shrimp Company Restaurant and Market was formed in San Clemente, California, and has 32 store locations worldwide. The first Bubba Gump restaurant was launched in Monterey, California by Viacom Consumer Products in 1996. 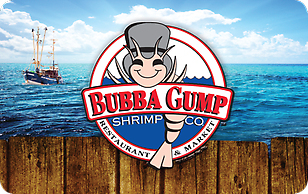 Sell Bubba Gump Shrimp Co gift cards on Cardpool.